So we are half way through the year and the time has come for a quick look at my progress so far. As I’ve previsouly stated, I only get 4 inches of hair per year but I’m glad with my progress. My hubby finally told me that I had long hair today. Before this he always said that my hair was mid length but it seems that I have graduated to long now! Men as not as easily impressed as women are, they tend to only think that hair is long when it fits the ‘white woman long’ bill rather than hair that is ‘long for a black woman’. Anyway, here is a quick comparison pic from the beginning of the year to now, I wore my bra over my shirt today because I couldn’t be bothered to put it on properly! Laziness personified! Anyway, it looks like I am grazing mid back length. 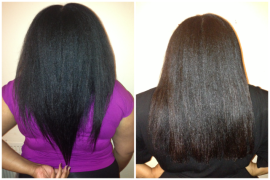 Just a visual to give you an idea of how far I’ve come in my hair journey, here is a comparison pic from when I started my hair journey in June 2008 with breaking relaxed hair, until now. My normal day to day do, weekly braidout, this one is actually 6 days old! I installed a weave but only had it in for 2 weeks. The weave is more or less the same length as my hair! The colour was a dead on match too. Love your blog. Just bookmarked! You go girl! I remember running across your blog sometime late last year. You have come so far and have encouraged me. I can tell your hair is your friend and keeps you going. Enjoy it!